And yes this chart is correct as you will find it listed the same way on the japanese version sites and a few of our version as well. And thats trading with the hard line traders level 100 and up. Imagine what you can do if you're not in a hurry for your cards (like me who always wants instant gratification). I hope this helps you guys in your future by killing 2 birds with one stone and strengthening not only your attack, but also your defense. Trade smart people! Good Luck! Just always remember the broader the realm boost window, the lower the actual base (level 1) of the boost will be. I think there's a few flaws with your logic. 1. At higher levels, you're not fighting with anything less than a 5 card deck, so the possibility of boosting more than 2 cards with a "1 type" boost is much higher. Getting a boost of 15% (valk) to 3 cards at 13k is going to be nearly a 6k boost. While getting 30% to one guy at 13k is only around 4k boost. 2. You should also take into account Skill-ups. I recall reading that Skilling up increases the % boost by 1% per skill level. So if your Self Boost is 30% at base, and you skill up 5 times, you get an additional 5% to just 1 card. But if your All boost is a 10% and you skill up just once, you get 1% for every card. With 5 cards, that makes 1 skill up on an "All boost" card equal to 5 skill ups on a "self boost" card. 3. Things that boost Attack and Defense generally aren't as good because you have to consider the raw values. For example, I would not want to use Mime on defense even though he has a big self +Atk/Def. A big boost on a small number is suddenly not so big...and Mime's defense value is small compared to others of his level. 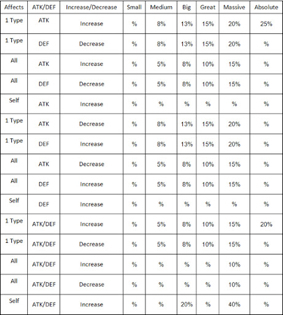 You need to make sure that both Attack and Defense values on the "boost both Atk/Def" cards are competitively high. I'm not saying that self-boost cards are bad. I'm saying they're situational and do the same regardless of the size of the deck, while Boost 1 type or all types skills get better the more people in your deck. Also, you have to consider that skill ups are better expended on "boost 1 type" or "boost all" skills.